Friday’s outing was the second game of Duke’s tour of Canada, following the 86-67 win over Ryerson University, also at Paramount Fine Foods Centre on Wednesday. 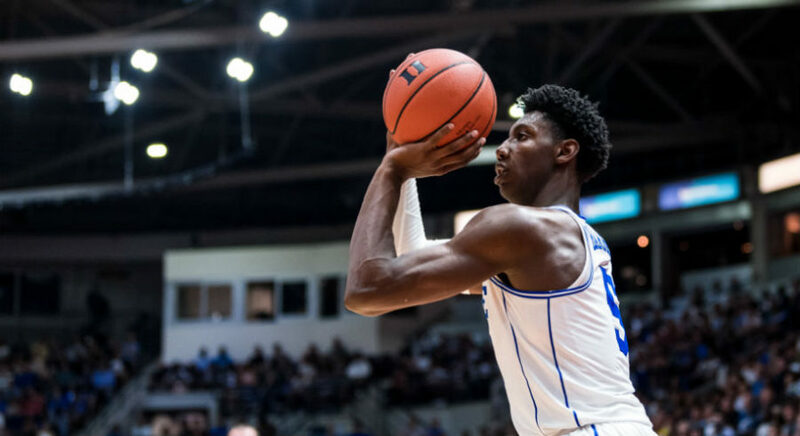 The 18-year-old Barrett, playing in his second hometown exhibition game for Duke, scored 35 points on 15 of 26 shooting and grabbed nine rebounds in his team-high 31 minutes on the floor. It was Barrett’s second 30 point game in the exhibition after he bagged 34 in the victory over Ryerson in midweek. Williamson, who also along with Barrett, thrilled the crowd at the Paramount Fine Foods Centre with a number of dunks, added 24 on 12 of 16 shooting to go with eight rebounds and two steals in 30 minutes for the Blue Devils. Also scoring in double figures on Friday night for Duke was Joey Baker, who finished with 11 points. He also pulled down five rebounds in the win. Meanwhile, senior forward Nikola Paradina collected a team-high 15 points to lead the way for the University of Toronto. Rookie Inaki Alvarez added 12 points, while Evan Shadkami had 11 points, five boards and three assists in 23 minutes in the loss. “It was a tremendous experience for our players,” said Blues head coach John Campbell. “It’s once in a lifetime to play against a program that is so historically significant. The Blue Devils will wrap up the three-game tour in Canda on Sunday against McGill.